Whenever I drive the Highways of America, I usually chuckle at the signs that say Historic Summerville or Historic Sanford or Historic Whatever. It’s like every little town wants to lay their claim on history because they read in a magazine that it might rejuvenate the economy of the township. That being said Georgia towns can lay claim to a lot of history, mostly Civil War stuff. I don’t mean to downplay the significance of all these hamlet‘s claims, but I want to point out that I have my doubts. One city that I was surprisingly impressed by is Buford, Georgia. All these little downtown districts have the cute little shops and the quaint restaurants, and Buford’s no exception. But there’s a couple of things that make Buford different. First, and foremost in my thinking, there’s the Museum of Buford. 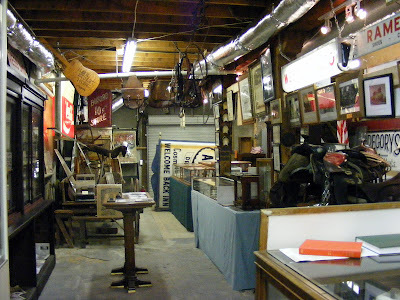 This is a little free museum run by Lynn Bowman in the basement of one of the shops. It’s nothing grand, basically about the size of two garages placed end over end. But its packed with just about anything they could scavenge from a city they loved as it was undergoing the changes time and development bring along. They have street signs and memorabilia from different organizations that called Buford home. It has the Trophies that the Bona Allen Shoemakers baseball team won in 1939 and 1945 in two different Semi Pro World Series. ( I’m a geek for baseball, as you probably know.) A friend described the museum as a really neat garage sale where nothing is for purchase, and I think that’s a fair assessment. But the best thing is that, they distribute free of charge, a one page pamphlet for a walking tour of Historic Buford (download map here). When they are closed the maps are in a mailbox holder at the top of the stairs. We went on the walking tour. 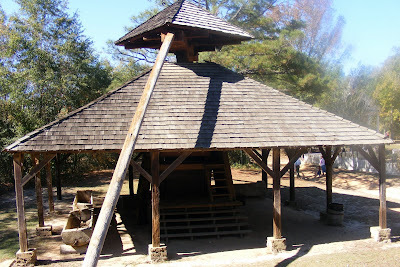 Second, it that the history of the town is different than that of other Georgia towns. Instead of Civil War history, this is the town that was built, lived and died, at the feet of a leather factory. At one time, it was world renown for its leather from the Bona Allen Factory. 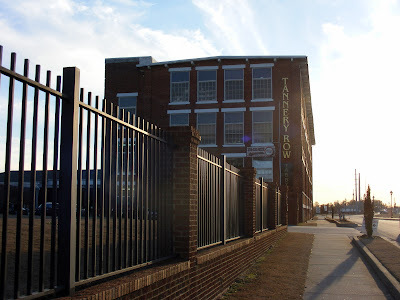 As you walk up and down the street, you will see the leather works and the horse and collar factory (Most of the shops are in buildings that once served the leatherworks). 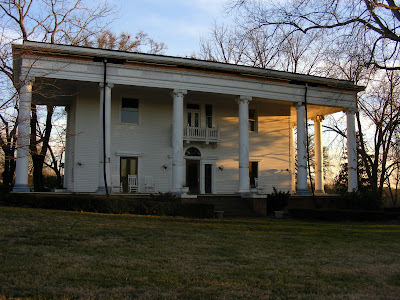 As well as the several beautiful homes and mansions built for notable members of the Bona Allen family. 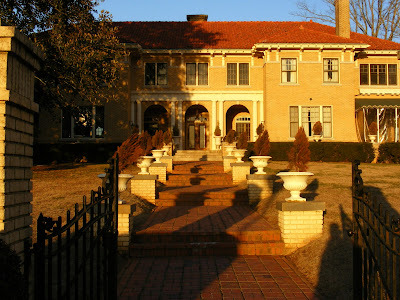 The Bona Allen, Sr Home is available for events. The Bona Allen Jr Home is actually for sale (for 1.5 million) and you can see the inside on the realtor’s website (b.n. the prev link has been pulled by the realtor but you can see the listing here). Additionally, there’s the old field where the Shoemakers baseball team played, complete with some of the earliest lighting systems for baseball installed in the late 30’s. 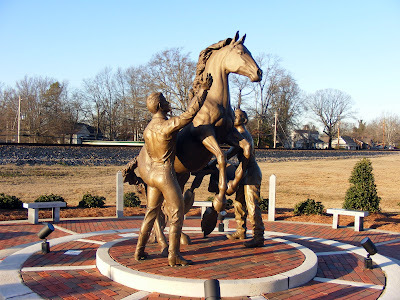 The newest addition to the journey is the Bronze sculpture of Roy Roger‘s horse Trigger (dedicated in 1996) a fitting tribute to a town known for its saddles. Third, and probably most interesting is the towns focus on visual arts. The main street has a couple of galleries. 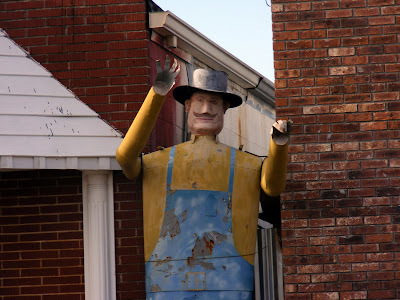 Across the tracks, is a shop that houses much of the local folk art, complete with a smiling tin man to greet you at the entrance. 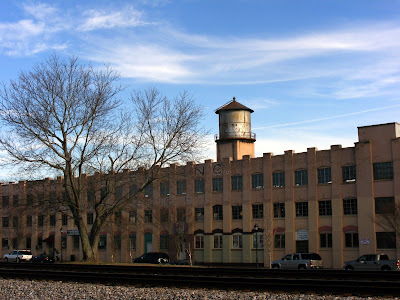 But the very crème of the crop is in the old Horse and Collar Factory, where there has been set up an active artist’s colony, know as the Tannery Row Artist‘s Colony. Here you can see Artist’s at work and even converse with some of them. This truly makes Buford different. If you walk the tour, you will spend about 2 miles on your feet. A good way to walk off your lunch. The most famous restaurant is Aqua Terra, but there’s 37 Main Speakeasyand Sunny Café on Main Street and The Pizza Pub and Tabby‘s Irish Pub at Tannery Row. We actually picnicked in the parked after picking up some terrific tamales for a buck a piece at Sonia’s Mercado and Carniceria, located in the main Bona Allen Factory. So believe it or not Buford has got something nifty to offer. If you like Old Homes the walking tour is very pleasant. If you are into Art this is very close to a must see. They also have a huge arts and crafts fair every third Saturday of the Month (Or so I‘ve heard but I yet to confirm). So Buford should be on the map for anyone interested in local flavor. 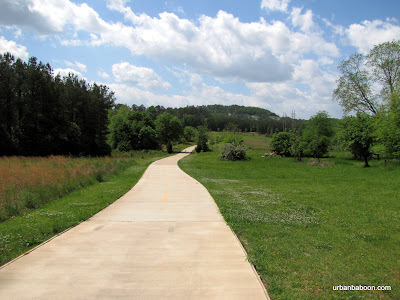 When I tried to explain to my friends my desire to go to Westville, in Lumpkin, Georgia [Stewart County], I told them it seems like it is a place that, much like Helen, Georgia is to Germany, it is to our state 150 years ago. That description is only mostly accurate, Helen is much more touristy with restaurants, shopping centers, and its ilk. Westville is simply what it claims to be a working pre-civil war Georgia town, you be hard pressed to find a fine dining experience in the vicinity, but there’s some nearby good BBQ. 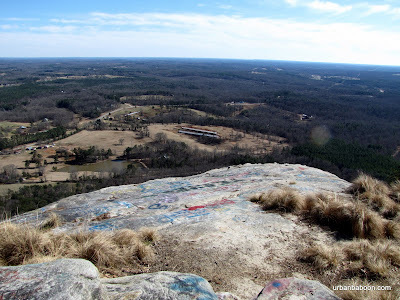 I hesitate to call it a hike, but you should wear comfortable shoes because you’ll walk along dirt roads for about two miles during your visit. What you see is quite interesting, you walk along and see over thirty pioneer Georgia buildings. 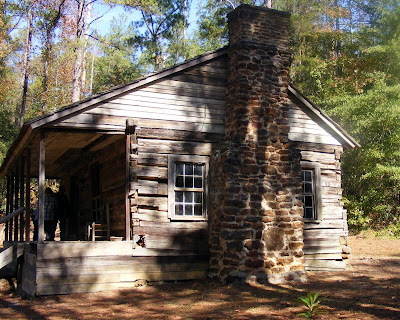 From Churches to a General Store to a Doctor’s office; from the rich Singer’s home to poor farmers Cabins; from blacksmiths to potters to bootmakers shops; its all there in this well thought out open Air Museum. When you arrive you have to pay admission at the gift shop, which is $10 for adults, $8 for college students, and $4 dollars for K-12 ($1 off coupon here), and exchange your money for scrip which is used throughout the venue. In case you want some lemonade or some cornbread (50 Cents each), or take a tour of the land in a mule drawn wagon ($1 a person), you need a little scrip (2 bucks each should suffice). There is a restaurant serving simple food in one of the houses and I believe that group takes cash. Inside you see a town at work. 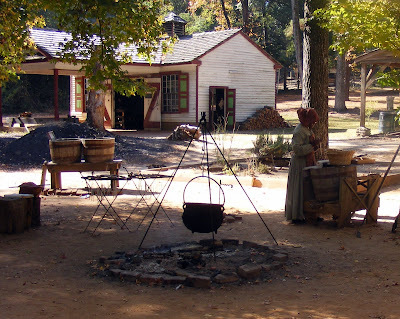 Workers in period gear ply their trades and educate you about what Georgia once was like. Unlike other reproductions I’ve seen, they let the characters be themselves, there's no pre planned script. We met a blacksmith who was complaining about the youths they hired not paying attention as he was trying to teach one how to make a nail. We met a very authentic heavy set black man making “sweetnin” and telling us it was good (making good a two syllable word). This sugar cane syrup was pretty disgusting to my palate, but as he explained it was all they had in the day. There was also a nice older lady who showed us how the loom worked, and as she pointed out all the drapes and linens on the site were made by that loom. The highlight of the trip was watching a cotton gin actually at work. They had two field hands working the gin. One would run the gin and speak to the visitors, the other tended to the mules which served as its engine. I’ve seen cotton before, and I’ve seen gins before, but I never saw one at work. It was truly fascinating, Most gins of the time used bulls, and they explained that the last bull died some twenty years before, and they switched to mules. There was a giant bailing machine next to the gin, but unfortunately (for me not them) they weren’t bailing that day. We went during the harvest festival, and they have several festivals and events throughout the year. On that day, there were singers and musicians in the courthouse, and you could sit a spell and enjoy some tunes. 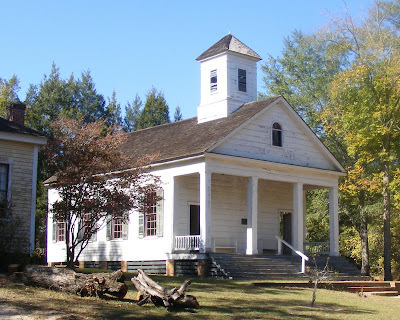 The Courthouse was from Cherokee County and I believe it is the oldest courthouse still standing in this state. The whole concept is a monument to Colonel John West, a former professor from North Georgia College in Dahlonega. The idea was to save old historic buildings and put them all in one place for future generations to see. All the buildings are real and have come from all corners of the state. I’m glad some folks have the foresight to preserve that which would otherwise fall by the wayside. 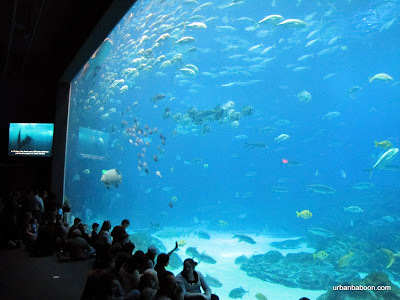 If you have kids, I’d say its worth a special trip, seeing it’s a clear two and a half hours outside of Atlanta. For adults, I would say you would be remiss if you were in the area and didn’t stop by. 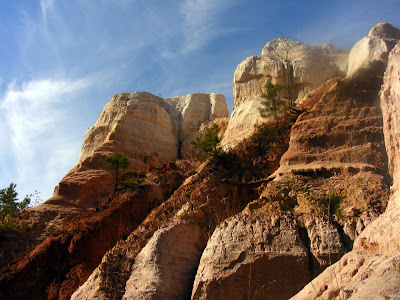 Or could be easily combined with a gorgeous nature walk at Providence Canyon State Park 5 miles away. If you like photography, they actually encourage you to take pictures, unlike most other museums. 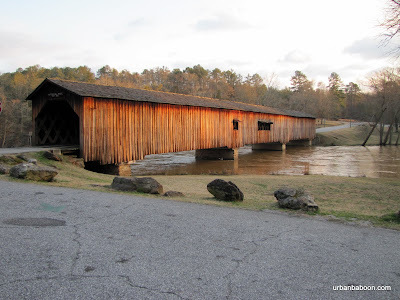 This is a gem of a place in Southwest Georgia and a pleasant gateway to a world that has passed us by. This Canyon, another of Georgia‘s Seven Natural Wonders is different in its beauty than other parts of Georgia I have seen. Stepping inside the canyon transports one’s mind to someplace further West. The Canyon is really a series of Gorges, some 16 in all, and some of them as deep as 150 feet. And this erosion tell a story in its splendor. 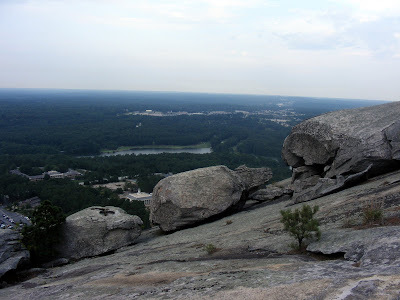 The story is Several Million years of Georgia’s geologic history. Admittedly, the erosion is, in part, man made, due primarily to poor farming techniques, lack of knowledge, and lack of future vision by farmers in the area in the 1800s. I don’t blame them, we learn much from our mistakes. But the byproduct result is a lovely panoramic view of whites, purples, pinks, reds, blacks and browns. 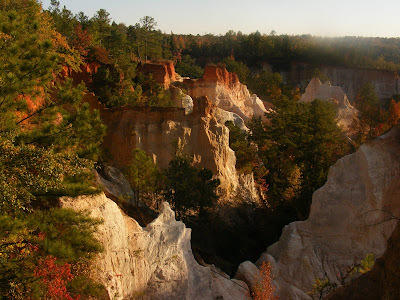 Providence Canyon sits within Providence Canyon State Park, and is a dayhikers dream. There is an easy 3 mile trail that takes you down into the Canyon to see, feel, and experience the walls of nine of the gorges first hand. 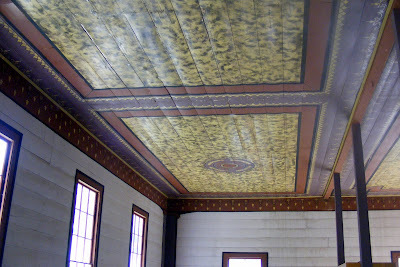 It then leads up and along the rim to view the colors of the walls in its totality. If you want a little more challenge, there is a 7 mile Back Country Trail, but I was warned not to go because the back areas are popular with hunters (if you go check hunting schedules and/or wear bright orange), I personally don’t take chances when guns are involved. 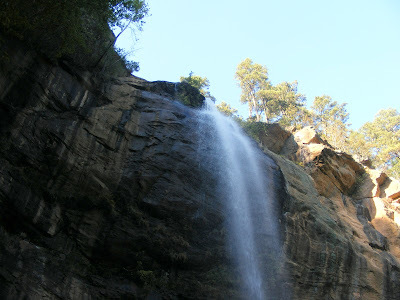 As you climb out of the ravine, there are a couple of other interesting things to see. First there’s a strange dead car graveyard that must be at least thirty years old. The signs explain that they have become a habitat to many of the local animals and important in a way that requires them not to be moved, so they will no doubt be there when you make your sojourn. The second is Providence Methodist Church, a church built in the early 1830’s and closed quite a while ago due the danger the expanding canyon presents. The old church is still there and you can explore the old cemetery with graves that date back to the early 1800’s. Like I said, despite its distance, it is breathtakingly worth the trip, Its also better to get there late in the day to see the setting sun work its magic on the Canyon Walls. 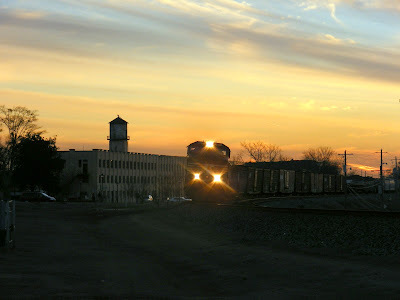 If you see it more of an overnighter there is camping, and plentiful reasonable hotel rooms in nearby Eufaula, Alabama. 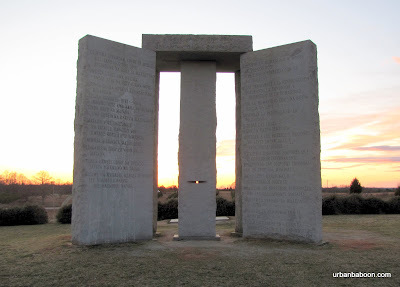 Its also within 5 miles of the equally intriguing town of Historic Westville.